Dr. Bragyova was elected Judge of the Constitutional Court by Parliament in September 2005. He graduated from the Faculty of Law of Eötvös Loránd University, Budapest, in 1975. Between 1975 and 1977 he worked as lawyer in the General Banking and Trust Co. Ltd. 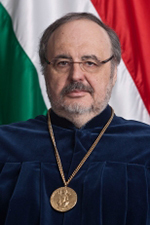 Since 1977 he has been research fellow in the Institute for Legal Sciences of the Hungarian Academy of Sciences, from 1999 as research professor. As an Alexander von Humboldt fellow, in 1990 he made research at the Freiburg University (Germany). Since the 1980’s he has taught at the Faculty of Law of Miskolc University, at the Department of International Law, then at the Department of Constitutional Law. Since 2000 he is a university professor and head of Doctoral School of the Faculty. Between 1994 and 2004 he was a recurrent visiting professor at the Department of Political Sciences at the Central European University. He earned candidate’s degree (CSc) in 1988, since 2003 he has been doctor of sciences at the Hungarian Academy of Sciences (DSc). His academic interest encompasses international law, constitutional law and legal philosophy.